The opening track “Hanashirube”, is credited to composer Mutsumi Nomiyama, with vocals by Annabel. It is a very pleasant track, with a relaxed vibe that only partially suggests what playing the game is like. Certainly the game can be relaxing at times, when you are considering what kinds of medicinal patches you want to create, for example. “Wish for Treasure” is a much more high-energy offering, composed by Kazuki Yanagawa, and captures the idea of running around, looking for alchemical ingredients. “Gnome” is a great example of the battle music. This kind of track is essential enjoying the game, as you try to figure out whether you want to drench your opponents in poison, or explode them with a lightning bomb. Credited to composer Daisuke Achiwa. “Just a Coffin and an Automaton” is another track by Kazuki Yanagawa that I really enjoy. It is majestic in the way only a symphony can achieve. There are a lot of other great cuts on the soundtrack, and some that I was less impressed by. In particular there are a number of whimsical tracks used during comedy scenes that are … meh. On the other hand, there are several musical interludes that are worked directly into the game, such as one bag-piping character. All in all, the music is quite enjoyable, and part of what makes the game fun to play. 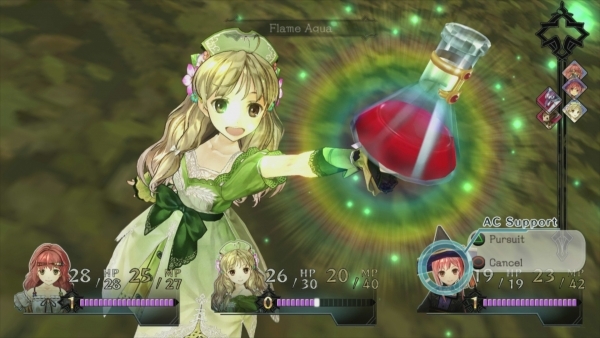 Check Atelier Ayesha out if you enjoy JRPGs or crafting and turn-based battles. Almost nearly all the Atelier series (including the Arland saga) contains great music. Definitely liked Wish for Treasure, but I preferred the Salamader and Undie battle themes. Just love the woodwind parts. This was the first Atelier game I have played, but I enjoyed it quite a bit, and part of the reason was the great music.